Mike Leavitt. Photo by Robin Bravender. Mike Leavitt has been Utah's governor, U.S. EPA's boss and the head of the Department of Health and Human Services. But his most "intriguing" job was leading the transition team in 2012 for Republican presidential nominee Mitt Romney. Romney's loss was a "profound disappointment," Leavitt said. But, he realized, someone must face that disappointment every four years when their candidate loses the race for the White House. Now Leavitt, who lives in Salt Lake City but makes regular trips to Washington, D.C., is helping both presidential campaigns prepare for transitions. 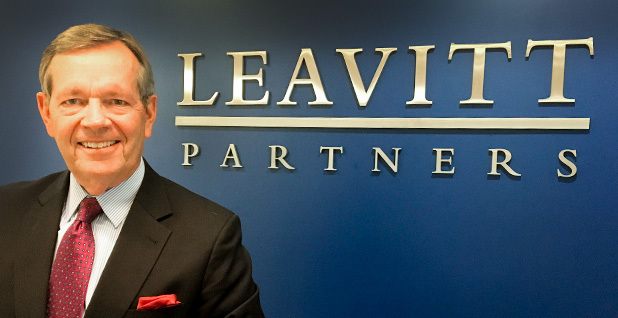 The former George W. Bush administration official — who led EPA from 2003 until 2005 — is chairman of the health care consulting firm Leavitt Partners. He sat down with Greenwire recently to discuss the disappointment of building a government that never materializes, his squelched dream of becoming a professional baseball player and the nickname he was given by President Bush. Are you involved in the campaign? My primary contribution this cycle is I have helped both the Clinton camp and the Trump camp begin to scope and prepare for a transition. And that came about through my participation and leadership of the 2012 transition. It was the first time that a campaign had prepared for transition under the Transition Act of 2010. So you're advising them on how transitions go? I help them on process. ... I've spent considerable time with them, and I'm happy to do it because I think these transitions are of great importance, transitions are a time of vulnerability for our country. We have this distinction as a democracy that we're able to do it without violence, but there are transitions that are done well, and there are those that aren't done as well. It's been my observation from the study of them that administrations that fail at transitioning rarely succeed. What was it like to map out a transition that never took place? It was a profound disappointment. We built a great ship that never sailed. I was governor three times, I was a Cabinet member twice, all of which I gained great satisfaction. But I will tell you, the one that was the most intriguing assignment I had was planning a government. ... We had it down to 3 o'clock on the afternoon after the election we would start with decisions, and we had decisions teed up. And we went to election night thinking that at 3 o'clock the next afternoon, the following things would happen. ... I woke up thinking, "Today is day 11, we would have done this, and we would have done that." I came to realize that every four years, somebody goes through this. What are you proudest of from your time at EPA? It was a short tenure, but we did a series of good things around the Great Lakes. We had the clean air rules, some of which were overturned, ultimately, by the courts. But we drove the new diesel rules and so forth. But as much as anything, I would say that I hope that my time there marked the importance of collaborative decisionmaking and collaborative leadership in matters related to the environment. What do you think of how politicized EPA has become? I think that politics has always been part of EPA, and it's because people hold different values and they view the definition of what environmentalism is differently. ... The way we battle on environmental stuff now is we stake out extremes and we go as though there's no middle ground until somebody's either willing to give up or there's a crisis that requires we settle, and at that point we find the balance. It's so much more productive when we say, "Look, there's a joint problem here. Let's recognize we have different values. Let's see if we can't find a solution first agreeing upon the things we agree upon and then finding ways to get to the balance." How did you get the EPA job? Was it something you were looking for? No, I got a call from the White House and they asked if I'd consider it. ... I had built a relationship through the president through many years, and I think he liked having people with whom he had enough of a relationship that he could trust them, and I think EPA was a place where he needed someone who he had confidence in. Do you think the Bush administration got a bad rap on environmental issues? I think they got caught up in what is always a partisan struggle, and it's in the interest of people who have one point of view to characterize as best they can the point of view of the other in as negative terms as they can. That's the way this town works. ... I know this, that the objective was to clean the air and to purify the water and to be respectful of the environment and to do it in a way that would allow society to have an economy, too, and we worked hard at it, and I think we did good things. I'm sure there are people who don't think it was aggressive enough, but I felt good about it. Not right now. I've had cats, and I've had dogs. I'm sort of a cat person. When I was governor, I had a cat at the office. The cat's name was Faux Paw — Faux Paw was an orange polydactyl cat. ... Polydactyl cats have six toes. ... We gave Faux Paw an email address, and Faux Paw became a media critic. So when people would write things that I thought were off-key, Faux Paw would write them an email and explain why they thought that was wrong. Then we gave Faux Paw a website, this was early in the internet days, and Faux Paw became kind of a media personality. Kids would come to the Capitol and they couldn't care less about seeing the governor, but they'd like to meet Faux Paw. Leavitt's wife has written children's books featuring Faux Paw. When you were a kid, what did you dream of doing as an adult? I was 32 years old, and I was sitting in an office, and it was my birthday, and this office happened to look into center field of a minor league baseball stadium. It was, at the time, the Salt Lake Bees. I thought to myself, "I'm 32 years old. I'm never going to be a professional baseball player." It was a startling moment when I realized that had passed me by. Somehow, I was among those that kind of thought somehow in my future, I would be a professional baseball player. That didn't happen. I'm a very conventional eater. I like straightforward food. ... In the dessert category, chocolate chip cookies with a little ice cream. I think in the meat category, I'm just straightforward beef or chicken. The one that people find really peculiar is I love calves' liver. What's the craziest thing that you've ever done that you're willing to tell a reporter about? I tried hang gliding once. It was in southern Utah, where I lived, and it was in the very early days of hang gliding. ... I was in college, and a friend of mine, I actually saw him hovering above a mountain and I was just awestruck by the thought of that. ... He said, "Well, I want to buy a new hang glider, would you like to buy this one?" ... He invited me to try it, and I went to a hillside. ... He had given me instructions as to how to take off, and so I tried to take off, and let's just say it wasn't a very happy experience and I skinned myself up. ... I had recently married, and I thought, "I am a man of some responsibility, I need to think this through again." ... I would put that in the category of crazy, wouldn't you? My middle name is Okerlund, it's my mother's maiden name. ... Somehow that became my nickname in high school was Okie. And I, like many other people, was nicknamed by the president, who was prone to do that. Although I lucked out because some of them weren't so dignified. I was just Mikey.